Halloween is all about the Monsters, the candy, and the fun. So why not put all three together for a sweet treat that would be perfect for your Halloween party or as a unique giveaway on Halloween night? I found this fun finger and bone ice cube tray in the Halloween section at Dollar Tree this week. Originally, I wasn't sure what to do with it, but it was too fun not to buy. 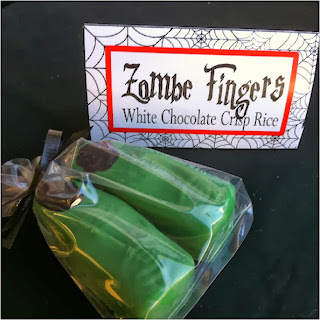 So I grabbed it and after watching "Warm Hearts" this week, I knew I had to make some Zombie fingers for my Halloween party table. It was pretty easy to start with some Dark Green Candy Melts and crisp rice cereal. I liked adding the rice cereal to it since it gave the fingers some texture and looked a little like rotting flesh through the chocolate. Just melt the chocolate in a glass bowl at 50% power in one minute increments until it's nice and smooth. When the chocolate is ready, add the cereal until it looks perfect to you. I added a bunch of crisp rice to mine so that it had a lot of texture. Add the chocolate and cereal mixture to the finger mold. Normally when working with chocolate and molds, the mold needs to be tapped onto a hard surface to ensure there are no air bubbles in the chocolate which will ruin the surface of the molded chocolate. But since I was making Zombie fingers, I didn't tap the chocolate out and let the air bubbles give the finger a distressed look. When ready, place the mold in the refrigerator for 5-10 minutes to harden. When they are ready, pop the fingers out. To finish the finger, melt a little bit of Black Candy Melts into a smooth consistency. Use a toothpick, skewer, or food paint brush to paint in the fingernail. 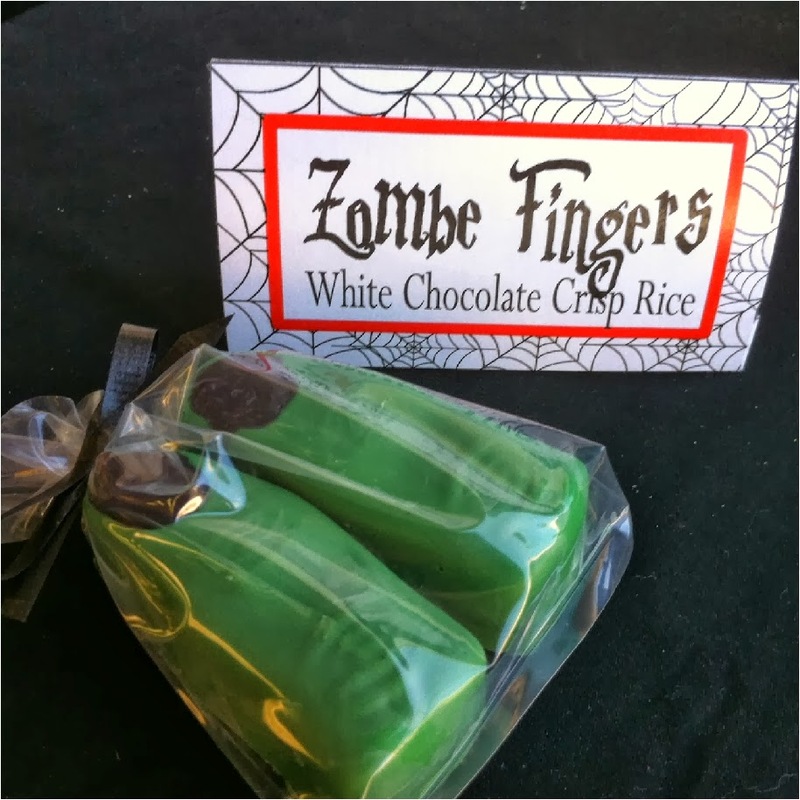 Your Zombie fingers can be placed on a plate to serve with a Spider Halloween table card explaining what the delectable treats are or they can be bagged up with a Zombie Finger Candy Topper like we did here. After all, serving the Halloween treats with a creative name is almost as fun as eating the candy itself! Awesome! I love spooky & ghoulish at Halloween and your "finger food" is perfect Kim! So fun!! Featuring you at this weekend's party! Thanks for linkin up to Sunday FUNday!